Have you noticed all the YA mermaid books out this year? 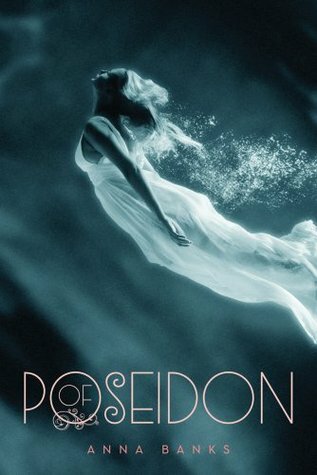 One of the books with the prettiest covers and most intriguing story lines is Of Poseidon by Anna Banks. The book doesn’t come out until later this month on May 22, but we’re giving you a chance to win an ARC of this coveted title now! Win a copy of Of Poseidon! Many thanks to our friends at Macmillan for this prize. Congratulations to Alexa from Code Name Blue, who won our big Preloved giveaway including the beautiful silver locket. Caitlin and Ann also won copies of the book for their hilarious 80s memories! Mandy from The Romance Bookie won our Story of Us giveaway, generously sponsored by Rachel from the LA Times Festival of Books event. And last but not least, Anna Clare from A Pocketful of Books won an ARC of The Vicious Deep. Hope you all enjoy your fantastic new reads! Fantastic book! Really enjoyed it. Fantastic love story with a little bit of mystery surrounding it! Would recommend to sci-fi lovers. Grrr, I miss this giveaway! BOO! I remember being four and building sandcastles on the beach..and somehow I ended up swallowing water. Apparently I supposedly was on the brink of drowning…but I think it was just my parents being paranoid. Even though it was really bad for the environment, one of my favorite moments on the beach was when my best friend’s plastic bucket was washed away by the ocean. We were chasing after the bucket, but it was to no avail. I can’t swim unfortunately! However, I need to learn as seventy percent of the Earth is made up of water. That’s a frightening statistic to those who can’t swim. I can’t swim, so I have no beach memories! :( However, I need to learn as seventy percent of the Earth is made up of water. That’s a frightening statistic for someone who can’t swim. Favourite swimming experience? There are definitely some fond memories of me and my family friends in our backyard pool. They make me question why we can’t just be kids forever. When my brothers and I were learning how to swim. It was a great bonding experience. My favorite beach memory, hmm. Probably when I went to a beautiful beach in italy last summer with a traveling group. it was so fun, and the beach wasn’t crowded! I used to be on the swim team and teaching my now husband to swim is something I will never forget haha. I hope I’m not posting/entering twice! If so, please delete any duplicates. Anyway, I’ve always seen the ocean as a symbol of freedom. So when I was having a really hard time in my life, I moved to northern California. There were other reasons, but I was comforted to be closer to the sea. I’ve always seen oceans as a symbol of freedom. So when I reached a difficult time in my life, I moved to California. There were many other reasons, of course, but I was comforted by the fact that I was near the sea. Definitely swimming at night!! It’s just my favorite. Best time would be when I snuck into an apartment pool. Great times!!! My friend, sister, and I snorkeled in Belize right after college – it was the best! Saw their coral, the fish, and rays! My favorite memories of water are a summer between junior and senior year of high school where my friends and I spent almost every night out at the lake. So many great times! I always feel great in the water. The way you can float on it. My sister and I always pretended to be mermaids, haha. We would tie our feet together, just to have the feeling of having a tail. My mother was always worried that we would drown, so she was there all the time, but we rocked it! My favorite beach memories isn’t really about the beach. I was in the Navy and we were out to sea and we were in the middle of a wicked storm – it tossed the ship a lot! I do not get sea sick. So it didn’t bother me. But I loved going up to the bridge to go on the helm to drive it during that kind of weather! It was crazy! You can not control the sea, so it was really difficult to control the ship! And watching the ocean jump over the bow of the ship was so pretty! The Ship would rock and trying to walk was interesting, that was an experience that is hard to describe when your walking up and down ladders. ha ha! Thank you for the give away Wendy! For one of my birthdays my husband took me to the beach and we made a sand castle and it was a lot of fun!!! Favorite beach memory so far: my now husband driving me out to the ocean as a birthday surprise the first year we were dating. I love going to the ocean, and to have him surprise me with a little adventure there was wonderful! I posted my fantasy on my TMST…you already read it Wendy. Scrunching my toes in the sand while walking on Hawaiian beaches…hot flame eating half naked luau guys…reading in a hammock by the ocean….sigh…thanks for the giveaway! I spend several weeks at the beach every summer, but my favorite memory by far is from more than ten years ago. I was a tween and it rained and stormed the entire trip, but there was a screened in porch that faced the ocean, and I stayed there and read the whole week. I had just discovered Tamora Pierce and Mercedes Lackey, and their fantasy worlds mixed with the wind and rain and salty air just enchanted me. Now as an adult, I would PAY to have a vacation like that again! I think my greatest swimming memory is from when I went to the wisconsin dells. I was in like second grade and it’s where I learned how to swim in a wave pool of all things. xD I also went on probably the scariest water ride I had ever been on, which involved falling straight down in a raft. it was 4 or 3 years ago when i had a trip to beach with my friends. it took almost 2 hours of driving to get there but what mattered the most was, we were happy! <3 we had a barbecue and randomly playing on the beach! Oh, I can´t swim, so I don´t have water related favorite memories, when I was a child I was terrified of the water (ocean, river, lake, even the swimming pool) thanks to the JAWS movie. I think my favorite water memory is probably going to Walden Lake (I think that’s what it’s called) when I was a child. My grandmother had a cabin there, and we would go spend a week. Even though I was a little terrified of swimming in a lake (fish…yuck! ), I remember those vacations as something special. I may also have learned to swim there. My favorite memory would be going to the beaches of Santa Cruz and Montery with my family and soaking up the beaches, and playing in the water. My family used to get a family membership to a private pool every summer. I learned to swim in that pool and working in the snack bar was my very first job. I’m a poor swimmer, but one of my favorite beach memories is watching the fireworks on the Fourth of July on Laguna Beach with my sister. It was my first trip to California, so the ocean and salt water was quite a novelty lol. Favorite water memory would be from when I was a kid.. My grandfather had a sailboat and we used to take it out on the gulf every weekend. Such good memories from that time! My favorite movie as a child was The LIttle Mermaid, and I spent a lot of time during the summer pretending to be Ariel while playing in the pool. What I didn’t like was being forced to be one of her sisters when I played with my friends. But at least the were better than Ursula. I was obsessed with The Little Mermaid as a child and spent a lot of time in the pool pretending to be Ariel. What I didn’t like was having to be one of her sisters when I played with my friends (but at least that was better than Ursula). My favorite ocean memory was a week my brother & I spent in South Carolina. It was gorgeous and so much fun. Scuba diving! We were underwater for more than an hour exploring the ruins of a sunken ship in my hometown. One of the best experiences of my life! My favorite water activity is snorkeling. I once snorkeled in Hawaii with sea turtles! It was such a magical experience being in the water with these creatures that fly in the water. Thanks for the chance to win! I love swimming in the ocean. I remember the first time I even went to the beach. I’d just learnt to swim in a swimming pool but it was so different out in the sea.